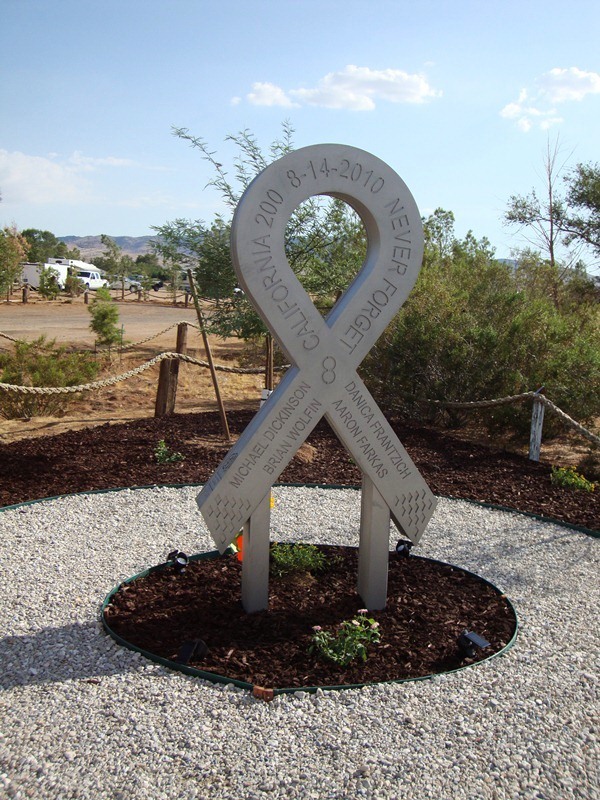 MESA, AZ – AUGUST 16, 2011: The MDR California 200 Memorial has been permanently located at the Slash-X Ranch Café at 28040 Barstow Road (Hwy 247) in Stoddard Valley, 8 miles south of Barstow, CA for all to visit for years to come. The dedication on Saturday August 13, 2011, one day less than a year after the accident that changed so many lives in the offroad community, was built around the true spirit of life. “The whole concept is meaningful: a figure 8 with the Ribbon Memorial sitting at the very top. Eight trees dedicated to those lost surround it, with 22 lights going up the walkway and 22 shrubs planted to represent the injured,” said Lucas Hand, project leader for FAST-Aid. Slash-X Ranch Café owner Brian Lynn graciously offered a piece of property to put this memorial. In a most unfortunate turn of events, Brian was killed in an auto accident three days before the dedication. The Lynn family was added to the prayers of all at the event. FAST-Aid would like to thank Green Army and CLS Landscaping for donating the 8 Trees, Ahern Rentals for donating the equipment, Worthing General Services in Santa Ana for donating Labor and Materials, and all the volunteers that have spent time on the ground working. The Memorial was originated by Dana Dague, designed by Scott Freeman, built by Craig Hall of R&I Industries and was mounted in concrete by Ted Cordts. The initial unveiling ceremony took place Saturday October 9, 2010 at 11am during the 2010 Lucas Oil Off-Road Expo in Pomona, CA.